This is the script of my presentation to the International Conference on the History of Cartography, Universidade Federal de Minas Gerais, Belo Horizonte, 13 July 2017. It is unaltered except: slide markers have been removed, images have been embedded as relevant, citations originally provided on slides have been cited as normal, and I have made small edits to make the work more suitable for this medium. A much fuller, and more cogent, account of this subject will appear as Chapter 5 of Cartography: The Ideal and Its History (2019). I am going to read my script, else I will set off on tangents and never finish. I must also thank my fellow panelists for welcoming me to their organized collaboration. The concept of “map scale” is so fundamental to modern cartography, and so familiar to map historians, that it seems timeless and universal. Today, I would like to demonstrate how it actually has a history. Let me start with my cryptic title. The English word scale — like échelle in French — derives from the Latin scala, or ladder. Any ladder-like thing is a scale: a mathematical series; a physical ruler with consistent graduations; or a line on a map that is consistently subdivided (fig. 1). These are all scales. Ladders bring snakes to mind. In the game of Snakes and Ladders one advances by climbing up ladders, but slides back down the snakes. Snakes represent the slippery ambiguities and complexities that have arisen as Western culture turned scale from a thing into the fundamental relationship between a map and the world. Fig. 1. Detail of the scale from Maraldi and Cassini III, Nouvelle carte qui comprend les principaux triangles (Paris, ). Library of Congress. And I use map scale for the congruency, or proportionality, of map to world. Map scale is not a thing; it is a concept, a relationship. It also only developed after 1800 as a major element of the idealization of “cartography.” As an historically emergent concept, map scale is inconsistent and paradoxical. It is a snake! maps, to be useful, are necessarily smaller than the areas mapped. Consequently every map must state the ratio or proportion between measurements on the map to those on the earth. This ratio is called the map scale …. So, what is map scale? A fundamental measure of the nature of the map or a phenomenon that, were it given physical expression, would tear the map apart? If scale is a ladder, map scale is a snake. There was no such ambiguity before 1800, for the simple reason that there was then no concept of map scale. An early term, “to scale,” specifically referred to the practice of drawing a diagram or a plan with the use of a graduated ruler — the scale — so that the image is congruent to the object. “To scale” was used only with maps of small things: properties, places, and regions. From surveying to drafting to use, such maps featured plane geometry. They expressed their congruency to the world in scales or verbal expressions. Scales specifically determined real-world distances without intermediate measurements: open a pair of dividers to span two places, match that opening against the scale, and read off the distance. Verbal expressions, such as “On a scale of 200 rods to an inch,” explicitly related the units that precisely subdivided rulers with and those for distances on the ground. Not directly instrumental, verbal expressions emphasize that the map is grounded in a consistent transformation from one system of measurement to another. By contrast, geographical maps of regions, continents, and the world took the earth’s curvature into account by deploying the markedly different, cosmographical geometry of latitude and longitude. The framework of meridians and parallels established the correspondence between the map and the world. Many readers used geographical maps to define real-world distances, and many featured one or more scales. Even so, geographical maps were never described as being “to scale” and none bore verbal expressions. Scales on regional maps were solely instruments to determine distances; they were not expressions of congruency. Fig. 2. A demonstration of areal distortion: each pair of quadrilaterals, the red and the green, has the same area on the earth but not on the map. Detail of Philippe Buache, after Guillaume Delisle, Carte d’Amerique dressée pour l’usage du Roy (Paris, 1780). Library of Congress. The issue, of course, is that projections of the curved earth to a flat map creates distortion. On this late version of Guillaume Delisle’s map of the Americas, areas enlarge away from the map’s center; here, each colored pair covers the same actual ground area (fig. 2). On world and continental maps, like this, a scale could not be used meaningfully and was omitted. This is one of several such maps whose author acknowledged that users might nonetheless still want to measure distances: Delisle explained how to use meridians as scales. Fig. 3. Definition of échelle from Encyclopédie (Paris, 1755), 5: 248 (ipad edition, ARTFL, University of Chicago). Before 1800, commentators did not think that all maps could be congruent to the world. On the one hand, they had no conception that there is a single category of “the map.” On the other, as these contemporary definitions indicate, “scale” was only a thing to be used (figs. 3 and 4). The categories of “large-scale” and “small-scale” did not exist. Instead, maps were distinguished as particular or general: particular maps were combined into more general ones. Some French usage distinguished between maps that showed the world in small or great detail, either petit point or grand point. The temptation to translate these terms today as “small-scale” and “large-scale” is, however, utterly anachronistic. At best, we see some appreciation for a general quality or principle of map scale when geographers compared maps. In his 1755 Essai sur l’histoire de la géographie, for example, Didier Robert de Vaugondy frequently compared two or more maps of the same region but only when they were “equal in the scale.” On occasion, however, Robert seems to have used échelle metonymically, extending the graphic thing into the concept. The same situation can be seen in Guillaume Delisle’s earlier comments about scales in his comparison of maps of Paris and London, as Mike Heffernan discussed on Monday. Fig. 5. Detail of the beginning of Allent’s (1803) descending scale of reduction factors. The ascending series of enlargement factors took the form x-to-1. In times of the size of diagrams or plans, Allent proposed that engineers would first identify the size of the smallest thing that had to be represented — whether the thread of a screw or the width of a road, with the assumption that this dimension would be drawn on the paper as 1 mm in extent — and then select the appropriate standardized reduction factor for the overall image (Allent 1803). 1/1, 1/2, 1/5, 1/10, 1/20, 1/50, 1/100, 1/200, 1/500, all the way to 1/50,000,000. He also soon began to apply the label of échelle métrique not to each entire series but to their individual terms, as revealed in an expanded analysis that would not be published for another two decades (Allent 1831). Here, in about 1803, is the birth of the modern échelle numerique, what in English is often called the representative fraction, and what I call the numerical ratio. 1) The numerical ratio was absolutely appropriate and relevant to use for images of small phenomena delineated with plane geometry: diagrams of instruments, and plans and elevations of architectural features up to and including entire fortifications. 2) The reduction factor was an approximation for chorographical maps and the new territorial maps pioneered by the Carte de France; such larger areas required a distorting projection, yes, but the projection could be constructed so that distortions did not accumulate significantly. 3) But the reduction factor was utterly inappropriate for maps of larger regions and the world, whose projections clearly displayed their inherent distortions. Allent’s reduction factors were a natural outgrowth of engineering practice, but could only be approximate or inadequate descriptors for other kinds of mapping practice. Thus, Allent did not propose a universal concept of map scale but a rational series of generic reduction factors intended only for other engineers. Other engineers properly adopted Allent’s reduction factors when working in plane geometry or on territorial projections. Even British engineers, by the 1850s, accepted this new-fangled French innovation: the Ordnance Survey then applied numerical ratios to new urban maps plotted at five feet to the inch, even as teaching manuals for the Royal Engineers described both the concept and the derivative classification of “large-scale” versus “small-scale” maps. Complexity arose in how non-engineers came to apply numerical ratios to geographical maps. The process began with geographers who mapped extensive areas in a consistent manner. In his Atlas national de la France en départemens of 1792, Pierre-Gregoire Chanlaire had mapped each of the new departments of France to the same scale. In explanation, he later added a note to the title page of the revised, 1810 edition, indicating how each map had been constructed to the same scale, of 1 ligne to 300 toises, or “1 on the paper” to “259,000 on the ground.” In 1827, Philippe Vandermaelen pushed the numerical ratio into inappropriate territory when he used it to describe the 380 sheets of his six-volume Atlas universal, all made to the same scale: “on the scale of 1/1,641,836 or of 1 ligne to 1900 toises.” Notice how both geographers now deployed verbal expressions to assert that, despite the projection, the map was indeed congruent to the world. Geographers of course struggled with the implications of applying the numerical ratio to their maps. Auguste-Henri Dufour, for example, was quite contradictory in the table of contents to his Atlas universel of 1864. He gave the numerical ratio of each of the atlas’s forty maps, except for the three that covered areas of “increasing latitude” such that no single numerical ratio was meaningful. Yet other maps in the same atlas covered much greater latitudinal extents and had nonetheless been assigned numerical ratios. What was needed, on every map and regardless of its nature, was the numerical ratio of 1:x. Only the abstract ratio could serve to define the degree to which a map reduced and generalized the world. Sure enough, we find in the early twentieth century that even world maps began to carry numerical ratios, as in the example of this world map from the 1937 Great Soviet Atlas, despite the inappropriateness of defining a single reduction factor for geographical maps. Also by 1900, dictionaries and textbooks universally defined “scale” as the ratio of distances on the map to distances on the ground, for all maps. “Scale,” originally a thing, had been metonymically extended into the concept of the relationship of map to world. Why were the snakes accepted? This short narrative of the rise of map scale has necessarily omitted many important factors. You will have noted, I am sure, that I have not mentioned marine mapping; but then, consideration of sea charts would not alter the fundamentals of my narrative. We can discern three broad periods in the history of map scale. Second, after 1800, Allent’s numerical ratio, intended as a codification of engineering practice, was steadily applied to all other kinds of spatial image. This conceptual expansion occurred in conjunction with the apparent collapse of hitherto discrete kinds of mapping into an apparently single endeavor under the emergent idealization of “cartography.” As Franz Lieber commented in 1834, cartography comprised “the drawing of geographical and topographical maps, charts, and all the drawing of mensuration.” This new concept did not take hold immediately, but developed in lock step with the acceptance of the numerical ratio as a valid descriptor for all maps. Allent, Pierre Alexandre Joseph. 1803. “Échelles métriques. Instruction sur la série générale et indéfinie d’échelles décimales. accompagnée d’un tableau qui développe cette série et ses applications, et d’une feuille de dessin qui donne la construction de trois échelles auxquelles on peut rapporter toutes les autres.” Mémorial de l’officier du génie 117–26. ———. 1831. 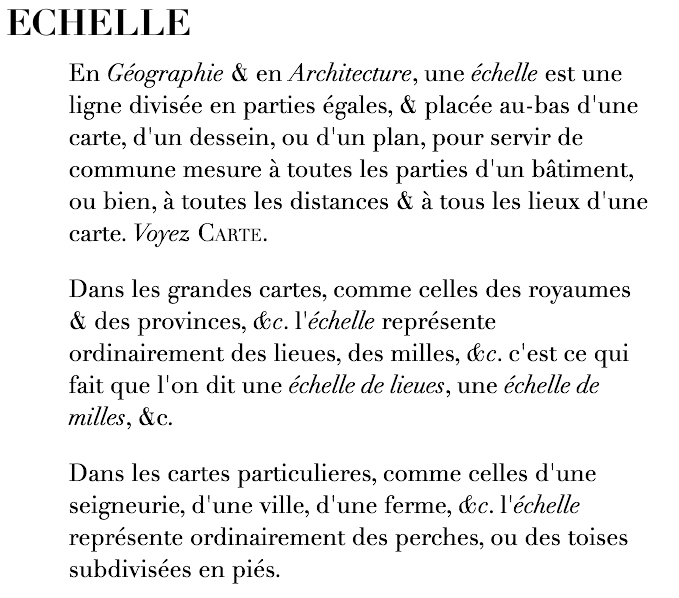 “Essai sur les échelles graphiques, et spécialement 1º sur les échelles géométrales et de perspective appliquées aux cartes et aux vues topographiques; 2º sur les échelles de pente, et les autres lignes caractéristiques de la surface du sol.” Mémorial du dépôt général de la Guerre 243–98. Anonymous. 1899. “Internationale Einführung gleichmassiger Maasseinheiten und Methoden,” in Verhandlungen des siebenten Internationalen Geographen-Kongresses, Berlin, 1899, 1: 96–139. Berlin: W. H. Kuhl. Robinson, Arthur H., Joel L. Morrison, Phillip C. Muehrcke, A. Jon Kimerling, and Stephen C. Guptill. 1995. Elements of Cartography. 6th ed. New York: John Wiley & Sons.